1. Melt the butter in a saucepan over medium heat. Whisk in the flour and cook for 1 minute, then whisk in the chicken broth and milk. When the milk begins to bubble, stir in the cheese and mustard. Season the sauce with salt and pepper, remove from the heat and cover to keep warm. 2. Preheat the oven to 250°. Using a food processor, finely grind the pretzels. Transfer to a shallow bowl and add the thyme. In another shallow bowl, beat the eggs. Coat the zucchini with the pretzel crumbs, then the egg, then the pretzel crumbs again. Repeat with the chicken. 3. In a large skillet, heat 1/2 cup olive oil over medium heat. Cook the chicken in 2 batches, turning, until firm, about 3 minutes on each side. Drain on paper towels; keep warm on a baking sheet in the oven. Repeat with the zucchini, adding more oil if necessary. 4. 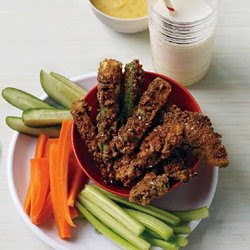 Serve the chicken fingers and zucchini sticks with the cheese sauce, along with the carrot sticks, celery sticks and dill pickle spears.